This course will examine the ethical issues that arose from the 1940 collapse of the Tacoma Narrows bridge in Washington state. This was one of the most dramatic bridge collapses in history, with fortunately no loss of life and little property damage other than the bridge itself. The collapse took place less than a year after completion of construction of the bridge. Out of this incident a serious ethical issue was illuminated for the engineering profession. Specifically, at what point is the profession’s theoretical and experiential knowledge insufficient to justify moving forward with a specific project or design scheme? And in the presence of weak experiential knowledge, is there a practicable way to supplement the experiential knowledge so as to move the project forward? In this course you will learn about how the engineering profession gained important new insights into the importance of aerodynamics in bridge design as a result of the ethical dilemma faced by the designers of the first Tacoma Narrows bridge. This course is intended for engineers, architects and other design and construction professionals wanting to learn about the ethical issues that were raised by the collapse of the Tacoma Narrows bridge, and the lessons engineers learned from this major engineering incident. Learn about the history of the project and the economic, commercial and national security issues that shaped its development. Learn about the two different design approaches suggested by different engineering teams. Learn about the ominous oscillations observed both during and after construction. Learn about the previously unseen mode of oscillation observed on the day of its collapse. Learn from file photos, and a link to an on-site video, what observers at the scene saw at the time. Learn about the technical investigation that followed the collapse. Learn about the vortex-shedding/resonance theory. Learn about the aerodynamic flutter theory. 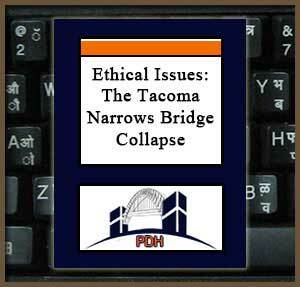 Learn about the ethical lessons learned from collapse of he Tacoma Narrows bridge. Learn about a tool employed by bridge engineers today to address the issues illuminated by the Tacoma Narrows bridge collapse..